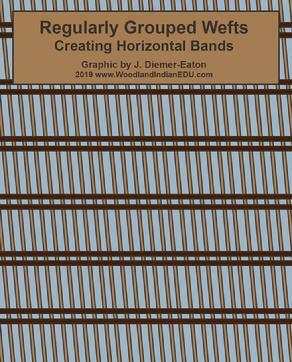 The following is written by Jessica Diemer-Eaton and presented by Woodland Indian Educational Programs. 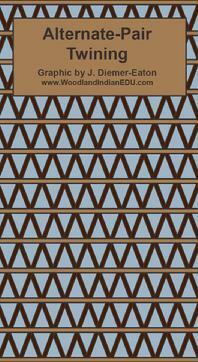 This page is designed primarily as a free online educational resource on the subject of Eastern Woodland Textile Arts. To cite the information from this page: Diemer-Eaton, Jessica. (2019, March). Pre-Columbian Textiles and Fiber Arts. Retrieved from http://www.woodlandindianedu.com/textileandfiberarts.html Second to an online resource, this page also shows the twining work of Jessica, who makes such styles of garments and bags for the needs of organizations and individuals… whether for exhibit and educational use, or regalia and personal use. 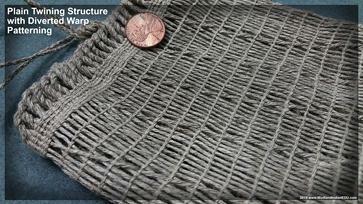 The following photos are of her twining works, accompanied by informational text and images of twining structures. 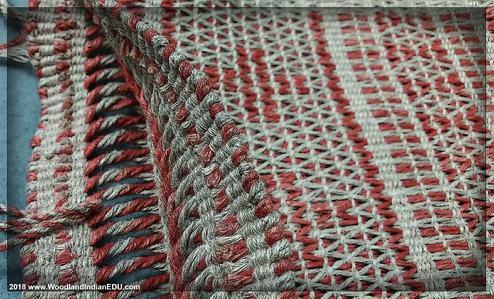 The bottom of this page contains informational links and sources, and contact info for those in need of twined textiles. 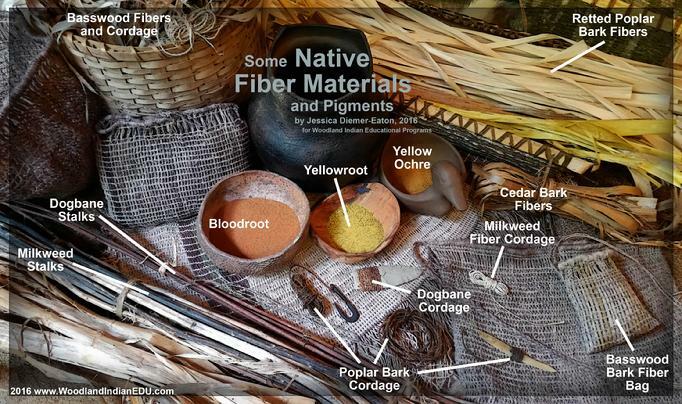 The historical record shows extensive plant-based textile use among Eastern Woodlands Peoples for thousands of years. And while educational outlets, experts and traditionalists have known this truth for generations now, it continues to filter far too slowly to the masses… still far short of being a part of the collective knowledge of North Americans (from all backgrounds). And not knowing or accepting this fact is not an inconsequential oversight… On the contrary, the ignorance of Indigenous textile production aids in the continued trivializing of Native technologies, and by extension the devaluing of Native Peoples, legitimizing unfounded settler narratives often dismissive of Native Peoples’ strong ties to their lands (lands that produced fibers through means of stationary flora). Jessica bases her pre-Columbian textile reproductions and representations on a variety of sources, including archaeological evidence from Woodland-period camp and cave sites in TN, MO, KY,… from Hopewell sites in Ohio,… from multiple Mississippian sites including Cahokia (IL), Spiro (OK), Etowah (GA), Angel (IN), and Wickliffe (KY)… as well as early contact artifacts from northern Iroquoian-speaking Peoples, and from early historical accounts from Muscogee-speaking Peoples in the south and Algonquian-speaking Peoples along the Atlantic coast, and from continued fiber traditions among the Western Great Lakes Peoples (both Algonquian and Siouan-speakers). 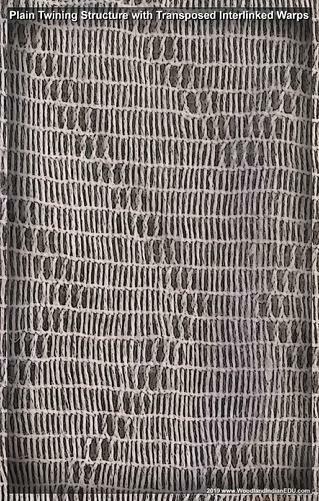 The following are photos of her textile work, detailing traditional materials used, and twining-patterns and edge-structures she reproduces. (Note: featherwork textiles - the history and reproduction of - are covered on another page: http://woodlandindianedu.com/feathermantlecloakcape.html ) Jessica does sell her textile work, which is usually utilized for educational, exhibit, cultural and regalia use (see bottom of page for more info). 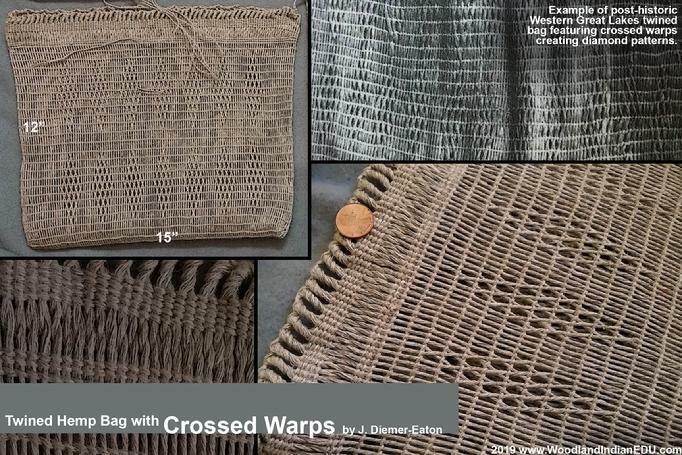 Jessica twines several different style of open-twine structures including plain, alternate-pair, diverted warp, transposed crossed diverted warps, transposed interlinked warps, and double-faced crossed-warp. 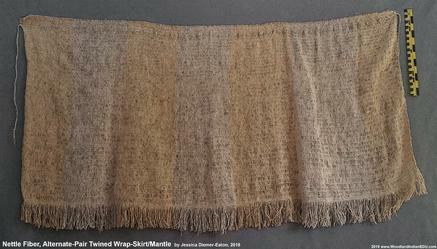 She also makes “stripped” twined textiles, either vertically in the warp (not pictured), or creating horizontal bands by grouping rows of wefts. 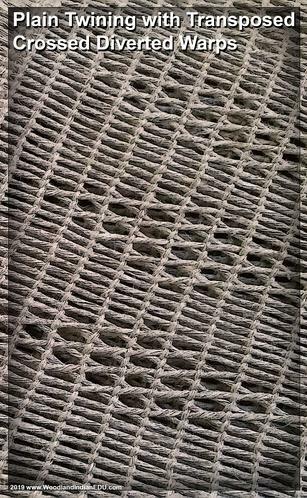 The following are pictures of her work… all these twining structures based on pre-Columbian textile evidence. 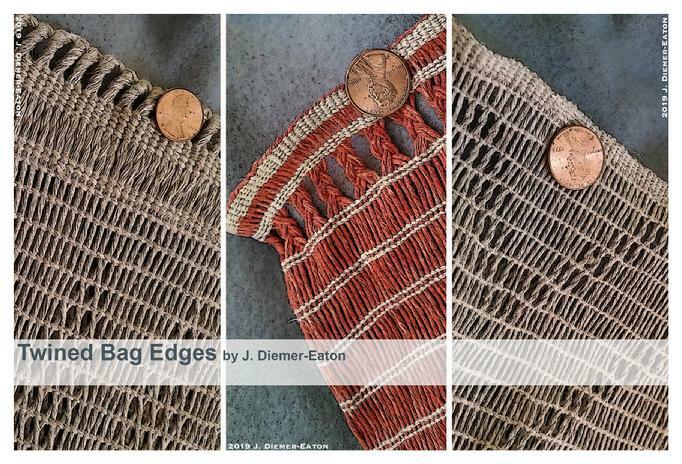 The edge structures Jessica recreates includes looped or “gathered” starting edges (not pictured here), loose edges (fringe), terminal and side edges/hems secured by turning back and securing the warps or wefts, and twisted-looped terminal edges (particularly used for lacing bags shut at the opening, to secure contents). 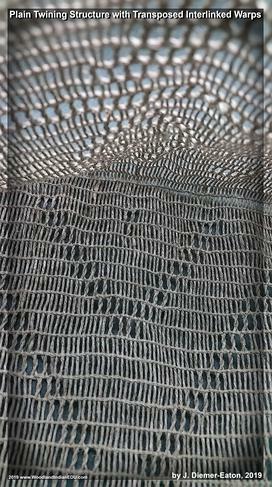 The following are photos of her edge work… all these edge structures based on pre-Columbian textile evidence. Pre-Columbian textiles of Eastern North America were often made of the inner bark layers of plants and trees. 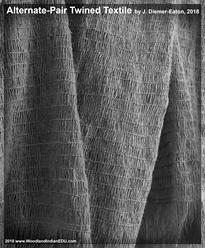 The bark fibers from pawpaw and mulberry species were used for the making of garments, particularly in the Southeast and Midwest. In the Northern Woodlands, it was the soft fibers from the bark of basswood trees that was targeted most. 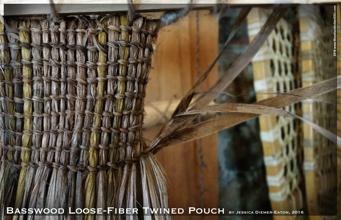 Elm, cedar, poplar, and even hickory yield workable fibers for cordage, and the bark of cedar was (and still is) used in making pouches and mats around the Great Lakes region. 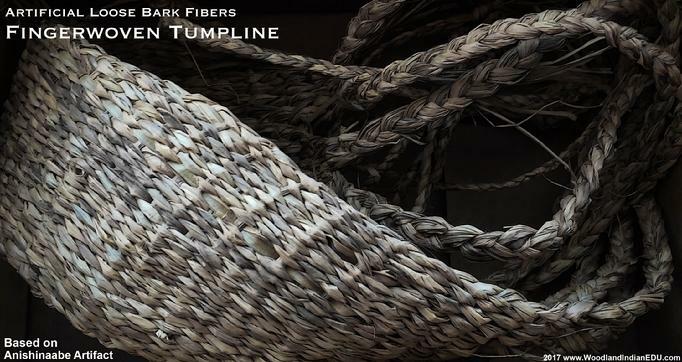 Although many early accounts refer to Native craftspeople as utilizing “wild hemp,” the fiber used was not from Old World hemp but of native species of nettles, milkweed, and dogbane. 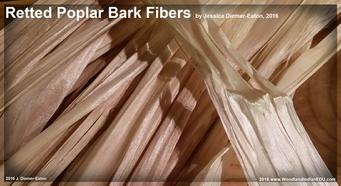 It was the stalk of these plants, and specifically the bark layer, that yielded long fibers. If the outer bark was fully discarded, plants like milkweed naturally produced light white threads. 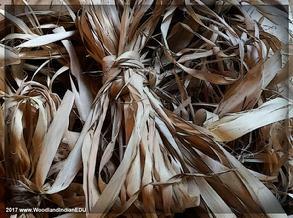 When processed the fibers of these plants were light and soft, suitable to make clothing from. And where it was native in the Southeast, yucca (including “bear-grass”) was also utilized for the strings that could be obtained by the leaf of the plant. 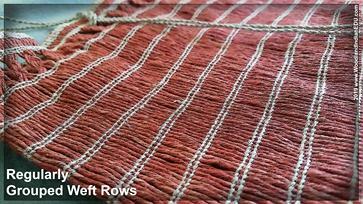 It should also be noted that at least some textiles worn in the Southeastern Woodlands, in the late pre-contact era, would have been made of (or contain some percentage of) New World cotton – such a resource likely filtering in from trade routes coming out of the Southwest. 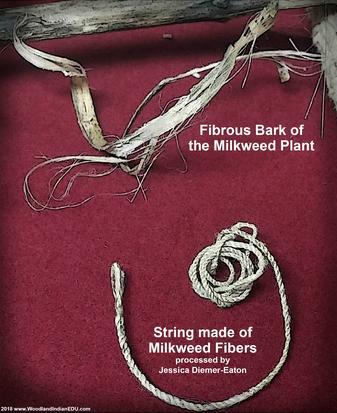 Jessica processes milkweed and dogbane stalks for fibers, and has made textiles with nettle fibers, harvested and spun overseas. 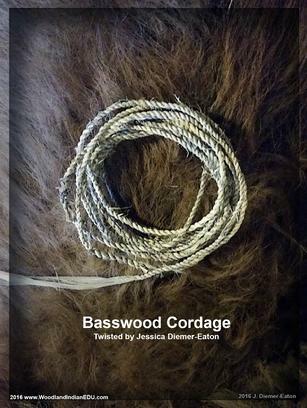 Alternatively, she does use unwaxed hemp to twine bags or fingerweave straps as well. 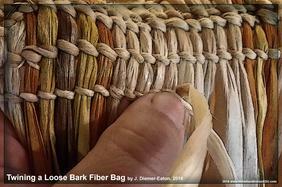 She often rets her own poplar bark fibers, but with no local source of basswood locally, she uses basswood harvested by others to make some of her bags. 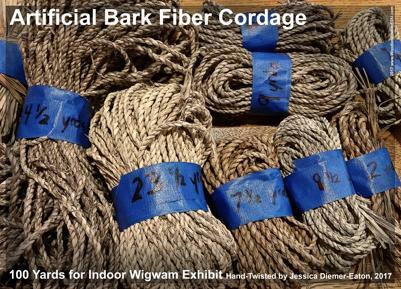 Jessica also creates bags, nets, straps, and cordage from artificial bark fibers… this faux material is a great alternative when obtaining real bark fibers is not feasible, especially for certain exhibit instillations. 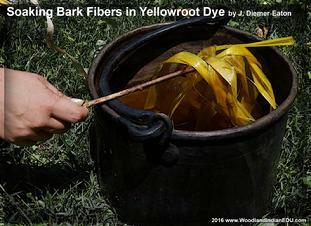 Using dye, she makes colored fibers for bag making, or mimics the bark fibers’ natural variation or aging in the faux materials. 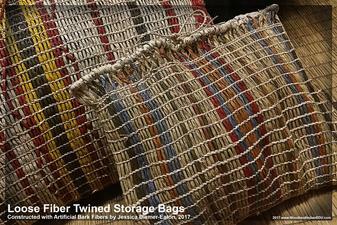 Pictured to the above left are a couple storage bags twined with artificial bark, and below is a fish net, tumpline, and yards of cordage (for an indoor wigwam exhibit) all made by Jessica using artificial bark material. 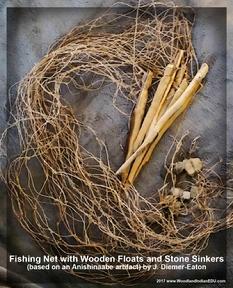 - Prehistoric Plies: A Structural and Comparative Analysis of Cordage, Netting, Basketry, and Fabric from Ozark Bluff Shelters. By Sandra Clements Scholtz. 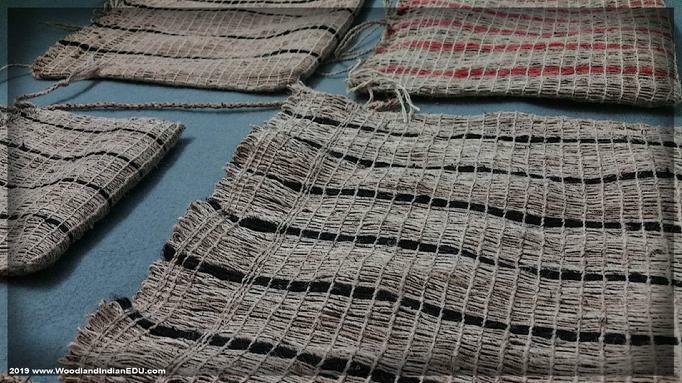 Pre-Columbian Textile Remnants can be Seen on Display at Cahokia Mounds SHS in Illinois, and at Etowah Mounds in Georgia, among other museums and visitors centers. * Please Note: If you are interested in owning and collecting Native art, we (WIEP) encourage you to do so... to support Native artisans by purchasing pieces created by enrolled tribal members. 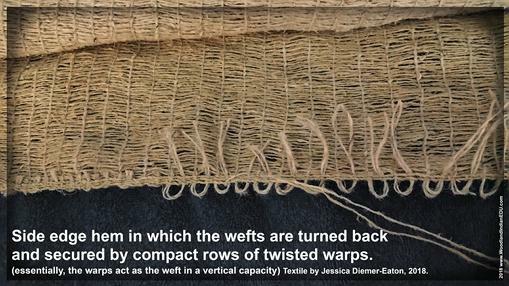 However the textiles pictured here and offered by WIEP is not Indian-made art... As we like to say, this is just Jessica-made stuff... made for the purpose of educational and traditional use.